The third Deus Ex has been officially titled Deus Ex: Human Revolution. Some of us may have noticed the name trademarked by Square Enix back in February, but it was formally announced by Eidos Montreal at this month's Game Developers Conference in San Francisco. A new teaser trailer was also unveiled, with CGI pre-rendered footage supplied by Square's experienced movie-making team. 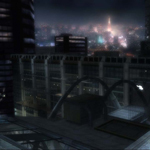 The video reveals the game's main character Adam Jensen as he slips from dreamscape to harsh reality. No additional details such as a release date have been announced yet, E3 later this year will probably prove to be stage for that. In the meantime, IGN has posted a Q&A with Game Director Jean-Francois Dugas which covers questions forwarded by fans. 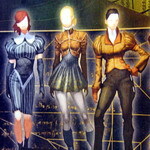 Other sites like Gamasutra have posted summaries of the panel given by Art Director Jonathan Jacques-Belletete about the process the team went through to arrive at the "Cyber-Renaissance" art style that pervades and distinguishes the game. 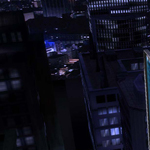 The long awaited Deus Ex total conversion, Nameless Mod, has finally been released. This huge mod has been in development for years and is now available for download. Newcomers may check out the trailer or manual to get an idea of what the mod is about and why it's causing a ripple in the community. British freelancer Richard Cobbett sings high praises and urges all fans to look past the odd premise and give the mod a try. Japanese giant Square Enix has made a buyout bid for Eidos, for $120 million - a 129% premium over the worth of the latter company's stock. Eidos has been the subject of buyout rumours for some time now, with its rocky financial state over the last few years. The buyout is likely to go ahead, and what effect this will have on the development of Deus Ex 3 remains to be seen. Australian magazine PC PowerPlay has a preview this month of Deus Ex 3. The snarky article doesn't uncover anything particularly new, and most questions are answered by the developers in vague terms. Regarding Eidos' approach to choices and consequences in the game, lead designer Jean-François Dugas cites Invisible War's fickle factions as an example of what they are trying to avoid. Community Manager René clarifies that the choices "will have an effect on you and the world rather than just being window dressing." It's been a while since we've heard about Deus Ex 3. The game seems to be covered by a shroud of mysterious information embargo; any article that appears online gets taken down almost immediately. A sharp fan at the official Eidos forums managed to find a gallery of high quality images at Gamestar where the original preview was no longer available for reading. 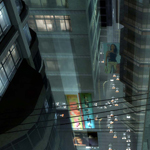 A new preview of Deus Ex 3 has appeared on Czech gaming site hratelne, and has stayed up. Reliable as ever, the enthusiastic fans provide a summary (and more detailed translation) of the article for us non-Czechs. While the preview treads familiar ground, it does drop a few new details. The dichotomic world of beautiful Renaissance-themed high rises towering over a dark, cyberpunk underbelly is set in 2027 and characterised by the dominance of privatised megacorporations over national governments. Out of the five world locations we will be seeing in the game, three have been revealed to be Shanghai, Detroit and Montreal. Apparently while the order in which we visit each metropolis is determined by the plot, the experiences within the locations will be much less linear. Interestingly, Adam's apartment will be a frequent stop on our travels, furnished with items that will tell us more about his past as well as a computer that will be updated with new data. The enemy AI will reportedly follow squad-based tactical routines, with a squad leader whose livelihood will determine the extent of their capabilities. They will also utilise the new cover system that will be available to us. 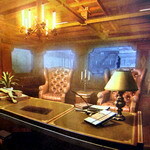 Bosses are to be expected, their difficulty depending on our previous actions. Some vague new details about augmentations have been revealed; there are four kinds: combat, stealth, technology and dialogue. Examples include X-ray vision, a 'claymore' explosive attack and a 'multi-kill' attack, as well as a kind of grappling wire ability that will facilitate scaling walls. The latest issue of Edge Magazine has an interview with lead game designer Jean-François Dugas, and a teaser of the article is online. 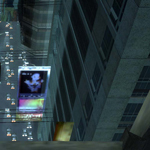 It appears Dugas has a few things to say about the first Deus Ex, and it's not all favourable. He claims that it was "kind of slow" and that "there weren’t enough exciting, memorable moments. It was aimed more towards a simulation rather than a game experience.” Understandably, the community is not too happy with his words. It is worth pointing out, as Kieron Gillen has done, that the teaser may not be representative of the full article, and that the tone presented online may not be the overall one set in the magazine. The latest issue of UK magazine PC Zone is now out in the hands of subscribers, and as promised by the last page of the previous issue, there is an exclusive first look at Deus Ex 3. CVG posted a teaser of the article on their site, no doubt the full preview will surface there in due time. In the mean time we will have to make do with scans of the images from the article which someone has kindly posted on their Flickr. This is the first substantial set of information we have received about the game since the teaser trailer, and I've been very eagerly awaiting it. 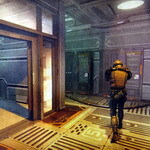 Most of the art in the article is concept but there are a few blurry in-game screenshots too. The art design certainly seems to be illustrating the described art direction of the game, apparently a mix of cyberpunk and the Renaissance movement. It's a strange combination to be sure, and I'm not seeing a comfortable settling between the two, but if they can pull it off it will be something quite unique and distinctive. Another difference from the previous games' aesthetic lies in the fact that the technology of the augmentations will be mechanical, as opposed to nano-based (ie. Gunther Hermann as opposed to JC Denton). This means that there will be visual differentiation between the various augmentations equipped, departing from the one-look nano-augmented agent idea. The screenshots don't tell us much, other than the game looks next-gen enough. At any rate, we do know a little bit about the engine as it has been used for the recent Tomb Raider games. It seems fully capable of giving us nice eye-candy, what remains to be seen is if it can deliver a robust RPG Shooter experience. It's encouraging to hear that the project has received the blessings of Warren Spector and Harvey Smith, and what's more, they intend to bring on board Sheldon Pacotti for consulting. I'm happy to hear the promises of a "powerful, layered" plot but this means nothing until we get to really see the extent of it. I do hope they can tie the plot into the other games, the more they change in the core game staples the more they need to hold on to what was important in the series. The gameplay tidbits have a few points to be concerned about. One of the first things that stood out to me was the auto-heal feature - reminiscent of the Halo and Call of Duty games. I don't think this feature has any place in a Deus Ex game as a core ability. 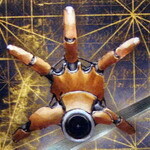 The first Deus Ex had a health regeneration augmentation and I don't understand why it can't be implemented in the same way here. The series is known for its slow-paced, explorative nature, so I would expect to quickly heal after any encounter. It is an unnecessary change that will remove tension. Another alarming issue is the converging of the stealth system into a cover system. Instead of relying on the shadows in the environment, it appears there will be an explicit cover operation that will pull you behind obstructions to hide from the enemy. Again, this is completely unnecessary in a game series that has a perfectly adequate design for the implementation of stealth. I would have thought that with the advancement of engine technology the game could have made full use of true dynamic lighting and shadow, like Invisible War promised but never delivered. The choice to separate the combat mechanics from the stats-based RPG mechanics is an interesting one. BioShock went down this route as well, making the game primarily a shooter. The problem most people had about this was that it distilled the core gameplay interaction down to combat, shifting the fundamental focus of the game from its spiritual predecessor. I think that the decision is a lot more dangerous to make with a game like Deus Ex, because unlike System Shock 2, the game was completely viable as a non-agressive RPG for the majority of the game. 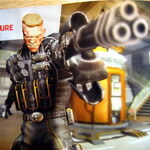 Making shooting a core aspect of the gameplay will improve the combat mechanics but may endanger the balance of gameplay styles fans expect in the series. All in all I have mixed feelings about the information released so far, but am getting the tingle of the hype machine and cannot wait for the inevitable flood of previews now that the embargo has been lifted. I noticed this article which mentioned that DX3 was going to be using the Tomb Raider engine (thanks van HellSing) and quickly realised that they were merely the messenger. The source seems to be this interview at Developmag.com. I'm relieved that here at Eidos we have two great internal engines - one from IO Interactive and one from Crystal. We chose the Crystal engine because we plan to help develop this engine more and then share it back with the rest of the company, the other Eidos studios. Having that technology from the start gives us a great advantage and foundation for our coders - there are no doubts about the approach, and we have few uncertainties. We just want to all work together on improving the same technology as we develop our game. Sounds like good news to me. Using an existing proprietary engine means they can launch right into game design, and a huge chunk of the budget gets spared. If you're like me and only peripherally aware of the Tomb Raider games and what the engine can do, aside from the obvious knack for curved surface meshes, you may want to take a browse ... just make sure you have safesearch turned on. Naturally TR has nothing of the look/feel that DX would require, but that is purely an art-direction enigma, not a rendering technology one. My only concern, or in this case lack thereof, is the Crysis-factor which eidos is possibly avoiding by choosing this engine. I don't know about everyone else, but a new game that does not require hardware upgrades to run is music to my ears. It turns out that this engine is not a stranger to dark urban environments, and in fact one of the TR games which uses it did present us with a Deus-Exish Tokyo level. The thumbnails are cropped, but the screens are not. Both have been de-Lara'd. These shots are several generations of the engine old of course, but I think the idea that it's capable of rendering these types of environments has been made plain. However, it still falls upon the art direction and level designers to make it happen. 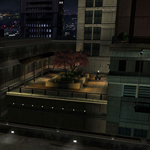 On the other hand, these shots look far more true to Deus Ex than Invisible War did. The venerable Kieron Gillen who, unlike myself, is an actual professional gaming journalist, has done what I have done but, also unlike myself, was a bit more serious about it, and did more research on the team than just look at the photos in the flash animation on the website. That said, the interesting article is still not terribly enlightening, as it mainly conjectures about what a DX3 game could be like as made by a bunch of guys and gals who have done many games nothing like Deus Ex. I think we were already on that page, but at least we now know the page number and how many pages there are. Coincidentally, he also answers a question I raised about the company size - they do plan on growing to be much, much larger than 80 people; four times that size in fact, but in fact plan on always keeping the team sizes down to 80. What I have not read is Kieron's article about Harvey Smith, the man some blame for DX2's faults who just released a new game, Blacksite Area 51. I have not read this article, but note that it does contain a screenshot of System Shock 1, which instantly makes it awesome. Thanks DX-455 for letting us know about the DX3 article. Proving yet again that those with a great deal of free time are a boon to those who have very little, Shacknews has done an image by image breakdown of the flashy part of the trailer. 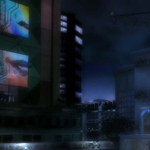 The game seems to focus heavily on the sociopolitical impact of biomodification as seen in the Deus Ex series. There's religious iconography, political divisiveness, potential terrorism, and segregation. And a representation of the Fibonacci sequence. It is all as the wikipedia article stated, but now you can see it all for yourself. 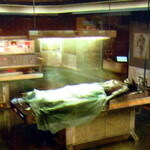 As discrimination against augments seems to be a common theme in these images, combined with the date on the ballot box, many have speculated that this game is a prequel. It is true that the canceled DX3 in development at ION Storm was a prequel. There is no reason to believe (in fact I'd say that it's unlikely) that this team and project are using any material from the canceled one, but that does not rule out the possibility that it is indeed a prequel. For what it's worth, I hope that it is. 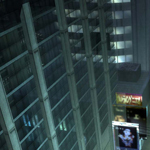 Part of Deus Ex's appeal to me was how close to home it was in the form of themes, settings, and organizations - DX2 in contrast was a distant futuristic setting which seemed detached from present day reality. DX3 moving in the opposite direction - more towards the real world, seems like it would give more of a good thing. Let's just hope that it doesn't overflow into that dangerously obscure 'too much of a good thing' area which I am not even of liberty to define at the moment. We'll see! I look forward to it. A Canadian Deus Ex. They chose an interesting subtitle: "3". Maybe it will have more in common with Deus Ex than the last two spinoffs: Invisible War and Project Snowblind. We've got this gamasutra article on the topic. D'Astous highlighted, "Montreal has low operational costs compared to other cities. Montreal has always been a city where the cost of living has been very reasonable, and this is also true for companies. So we can control our costs. The real estate is quite reasonable, the talent is there and that’s certainly an important point -- even though our dollar is going up, I think we are still very competitive on that side." Hilarious. So we're getting a Canadian Deux Ex because it's cheaper that way. I love it. So it's a new studio, new goals, new ambitions, and this is their first project. Maybe that's fitting - Deus Ex started that way, after all. These guys don't have an 'idea guru' as their leader though, which may not be a bad thing. Oh look my coffee is done. Actually they do have this Stéphane D’Astous guy in charge of things. Let's see what his online profile looks like. ... seems like he's got several upper-management credits for various console games listed under him. (Thanks henke and HellSing.) Well all of those games shipped, so I guess we have that! Mmm, nothing like a hot cup of coffee at 7:38 am est on 11/27/2007. So they're going to be developing [meaningless marketing term] using only [meaningless marketing term]! This is great news guys! Thankfully the next paragraph contains some actual information in it. I am not at all sure, but I think that 80 people is about how many ION Storm had while doing DXIW and TDS (okay I made that up) so I guess that's a good number to be making two games at once, right? 24 months sounds like a great span of time to get people excited, let them grow apathetic, and then give them time to forget their apathy and get excited again in time for release! This brings us to a website for the developer. What does this site teach us about this developer? They use Dell Gaming Laptops, have toys on their desks, they read books, and take pills. They advertise other eidos games to their employees. Their office is well lit. They think that pipes and wires and hardware is COOL. Their office may be HAUNTED. Which brings us to Their Deus Ex Page. No, don't watch the flash animation. The sounds aren't coming from there. Scroll down to the teaser trailer. Yes, down there. Once you get past the awful IN A WORLD voiceover you can listen to a few scant seconds of (no sarcasm here, honest) totally awesome Deus Ex 1 remixed OST music (no not the original umod music) which for a few scant seconds may make you want to believe that this is the answer to all of your prayers for a good Deus Ex sequel. It may! So what does this teaser tell us? That their team is a manager, someone who knows 3ds Max, The Movie Trailer Voice Guy, and an audio mixer? Aside from that, it seems to show an embryo which already has glowly lights and mechanical parts, and then a flashy too-fast-to-really-see so-how-could-it-actually-be-important series of images which only wikipedia could decrypt. Damn these guys are good! Makes me think that I should leave coverage of this game to Wikipedia and stick to Thief Fan Missions! Other than the teaser, we get nothing else from this page - other than that someone seems to think that a PC is now a next-gen console, and that the blurb about which game systems they are developing for actually has nothing to do with Deus Ex 3 itself. Well if you're still reading I am sure you want to read what a bunch of other people think, all of whom are probably just as qualified as I to have written all of the above, so check out the threads in General Gaming and Deus Ex General about it. The developer also has a forum, but why should we care? This is TTLG! Okay, I am done. Look at how much time I wasted. It's 8:00 am now, and I have schoolwork to do. Oh well - at least my coffee is still hot. Gamespot is reporting that Ion Storm's Warren Spector has quit the company to "to pursue personal interests". It is rumoured that he is in negotiations with Midway to head up an Austin based studio or work with Eidos as an IP consultant. Good luck to Mr. Spector with whatever he chooses! TTLG Forums visitor Walton Simons (how appropriate) has written up a nice couple-pages report derived from all of the available information present in Deus Ex regarding the Series P agents. Most interesting, probably, is conflicting reports about their internals, and mention that the P agents, according to in-game texts, are allegedly not modified. Interesting. You can read that here. And by the way, if you saw anything in the game about MIB agents having an air filtration system in their augmented bodies, stop by this TTLG forums thread and help Mr. Simons out with his report. He is looking for this rumored information in the game. Steve Tack, long-time community member and project leader of the Zodiac mission set posted a small update last week regarding the progress of his work. According to him, work on part three is 75% done! This is definitely good evidence, along with the ever-progressing Nameless mod, among others, that the original Deus Ex is nowhere near dead silent yet. Stay tuned to Steve's Zodiac site for the latest skinny on his work, and break out that old copy of Deus Ex and fire up his missions if you haven't already. While you're at it, grab Redsun (a few news items down). A severe degredation of quality. I suppose the game could be good in its own right, but I am very disgusted to see Eidos whoring around the Deus Ex name as it has been. At least the name didn't stick. A Through the Looking Gless Website © 2009 TTLG. Design by Daniel "Digital Nightfall" Todd. Deus Ex © 2009 Eidos Interactive Limited.